Watermark was recently featured on Senior Housing News in the article Dished: Hot New Trends in Memory Care published on July 25th, 2017. To view the article, please click here. Unintentional weight loss and unhealthy meals like chicken nuggets, fish sticks and French fries, all lacking any nutritional value, are a thing of the past. As new dining trends for memory care residents pop up around the county, Watermark Retirement Communities has sought to overhaul their memory care dining with its innovative Thrive Dining™ concept. Watermark aims to have the program in all of its 50 communities by the end of the year. 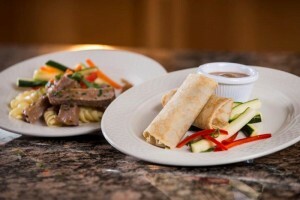 Thrive Dining™ seeks to restore the joy of dining for individuals living with physical and cognitive changes by serving tasty, nutritionally balanced and protein packed bite size hors d’oeuvres. Now, favorite foods can be enjoyed without assistance, without utensils and without distractions from the task at hand: enjoying a meal with family or friends. Menu items might include a hearty casserole of eggs, ham and cheese served with fresh fruit, beef brisket wrapped in a flaky pastry served with julienne vegetables, or even chef salad bites with a dipping sauce. “The beauty of this program is we’re taking our fresh food that we’re providing daily [in other parts of the community] and giving access to our memory care residents,” says Rob Bobbitt, Watermark’s National Director of Dining Services. Curious about Thrive Dining? Please join us for a Thrive Dining™ Lunch Tasting and Chef Demonstration. To inquire about tasting days and times, please call 1-302-565-4160.